Instantly create the full-body bombshell hair you’ve always dreamed of! Boost-It is a one piece hair add-on that will instantly give you a fuller look without teasing. Made of “Human-like” synthetic fibers, Boost-it is heat friendly and will give the most natural flow and shine. Boost-it will always hold its luscious shape, so no need for hot rollers or curlers. Not only can boost-it be used for volume, it is great for women with very short hair. As long as there is enough hair on top to cover the seam, you’re good to go! Not to mention if you have wavy to extremely curly hair, we know how tiring and time consuming it can be to constantly straighten. Boost-it will cut down 70% of that straightening time since you only have to straighten what hair goes over top. Boost-it comes 24” long and beautifully styled with layers and waves at the ends. 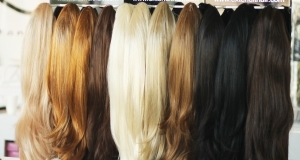 It is made of a special synthetic fiber that resembles human hair. This special synthetic fiber can actually take heat without melting or frizzing. The Boost-It’s style won’t change unless heat is used to alter the appearance. Boost it has 6 clips that will hold securely around the back of your head. These clips are the same type of clips used in our premium quality Remy Cuticle Human Hair extensions, so the same Life-time Guarantee applies.